Despite living with Ranen who remained committed to her throughout, the memories that reflected Anupam’s presence captivated Anjali to the extent of adultery. The day, when the two estranged couples decided to surrender themselves entirely to each other, undoubtedly took a long time to come, but its arrival was necessary at least for Anjali who never counted on Ranen as a grace to her life. She could have easily given Anupam and herself a second chance to rectify their past mistake and re- live the life together they dreamt of once. But at the nick of time, a strong tug of her conscience pulled her far away into the world of reality making Anupam’s presence in her life just a hallucination. 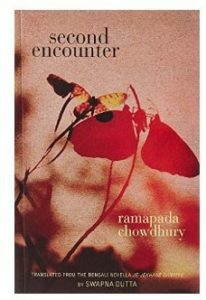 Nothing has been exaggerated in the novella by Ramapada Chowdhury who was born in a small town of undivided Bengal in Kharagpur. “Second Encounter” is a simple story wrapped in the common feeling of love, loaded with incidents that can never go under- rated. But the story has certain characteristics of a problem play. The novella, which finely adjusted its sail on the changing ripples of love and life, tactfully diverted the mind of readers towards unanswered questions and expectations already existing in them. Is it really hard to state the main aim of love and is physical intimacy really required to prove how genuine the love is? And do values and outlook change when one considers one’s children? In the beginning we see Anita and Anupam, much like Ranen and Anjali, silently making their way out to happiness, enjoying each other presences satisfactorily. Even after their meeting, Ranen and Anita turned blind towards the explicit feelings Anupam and Anjali showed for each other or maybe they pretended to remain blind. Many a times, Anupam thought to get rid of Anita because somewhere Anjali’s reciprocation was giving him a false hope. But in spite of harvesting this belief, Anupam knew that Anjali can never be his destiny. He can admire her from far but can never be with her. The chapter dealing with Anjali- Anupam’s love making may become the target of criticism. It presented Anjali as a feeble woman and Anupam as a desperate admirer but out beyond these criticisms one has to understand how much the characters kept on breaking their heart to open it in front of each other. Reason is powerless in the expression of love and this Anupam- Anjali proved at that moment by avoiding the surrounding reality and flowing with the time. But it seems quite odd when we learn the way Anjali treats Anupam the morning after spending hours in his caress. Wasn’t she aware of the fact that she was doing or did she realize that Anupam was not her love but infatuation? Decades it took to shed off the coyness and freely express their constant love for each other. And just hours of closeness made Anjali to attempt every possible way to keep herself away from Anupam. The man who was once a feast to her eyes, now his very presence seems to draw Anjali’s eyes out of sockets. The second encounter was necessary to clear out every question whose answer was in vague. The encounter brought salvation and curse, lose and discovery, death and incarnation for the wanderers. It put Anjali and Anupam undoubtedly, far away from each other yet on the opposite their love got incarnated in Jhumjhum and Bappa, sensitive teenagers, weaving their story on the weak thread of desires. Jhumjhum, Anjali’s daughter, was carefree like her mother and there was a trace of seriousness on the face of Bappa who inherited it from his father Anupam. Both, unlike their respective parents, were not slow at confession and shared a very strong chemistry with each other. Their taunts and jokes very soon took the place of praises and promises but probably they paid price for the sin their parents made. In the end the departing train, which on one side gave a complete halt to the relation of Anupam and Anjali, on the contrary gave a vague signal to Bappa who remained their watching Jhumjhum leaving him, hoping to have second encounter with her! Originally translated from a Bengali novella “Je Jekhane Danriye”, “Second Encounter” speaks the efforts of Swapna Dutta in a very fluent way. The work falsifies the myth that love cannot remain constant after marriage and at the same time it testifies the fact that it loses its importance when forced or misused. In spite of living on a small salary and though desiring for a lavish lifestyle, Anita didn’t stop relying on Anupam for everything and despite knowing about his wife’s past history, Ranen always remained faithful to Anjali. Altogether “Second Encounter” is a good read with a simple story on love, reconciliation, and estrangement. Musabani as a place with its beautiful scenic description will not fail in attracting readers. Emotions and dialogues understood each other brilliantly but the end added unexpected charm to the work, making hollowness engulf us from within. 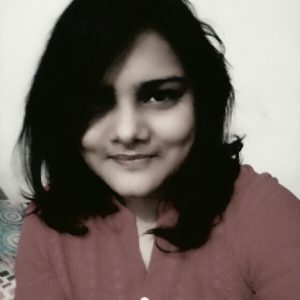 Ginnie Singh (Columnist, Reviews) is a scholar from Dhanbad, Jharkhand with her major in English Language and Literature.